Pick your bat model, then pick your colors! 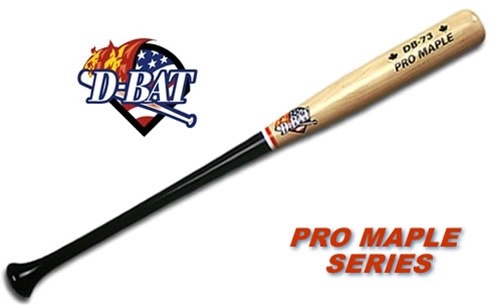 Choose from 10 different models in D-Bats's Pro Maple bat series. D-Bat has been manufacturing maple bats for some time, and the popularity of maple bats has exploded over the last three years. Sugar maple, sometimes called black maple, rock maple, or hard maple, is the ideal wood for building maple bats. All other maples are not classified as hardwoods. The comparison of maple to ash can be simplified as follows: Sugar maple is a more dense, harder, stronger, and heavier wood than ash. We're not aware of any scientific testing that shows that maple bats hit harder or faster than ash, even though most players believe they do. Bats are cupped and the Length/weight ratio is their standard -3. See the chart below for differences between the models. Add a Laser-branded signature for $7.50 extra. Please allow 7-10 days for delivery.